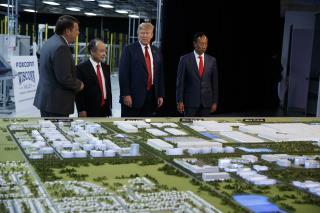 (Newser) – President Trump highlighted his economic policies Thursday at the groundbreaking for a massive $10 billion Foxconn factory complex that may bring thousands of jobs to Wisconsin, a state he narrowly won in 2016. At the same time, Trump kept up his running feud with an iconic American company based in the state, the AP reports: Harley-Davidson. "America is open for business more than it has ever been open for business. Made in the USA: It's all happening and it's happening very, very quickly," Trump thundered after visiting the future Foxconn factory. "Today we're seeing the results of the pro-America agenda. America First, Make America Great Again. Greatest phrase ever used in politics, I suspect." The Foxconn project could employ up to 13,000 people, though opponents say it is costing Wisconsin taxpayers too much. Trump's celebration came against a backdrop of less-rosy economic news: Harley-Davidson recently announced it is moving some motorcycle production overseas to avoid European Union tariffs that are a product of Trump's escalating trade dispute with longstanding US allies. Trump diverted from his upbeat message Thursday to work in a message to the motorcycle manufacturer. "Harley-Davidson, please build those beautiful motorcycles in the US. Build them in the USA. Don't get cute with us," Trump said. "Build them in the USA. Your customers won't be happy if you don't." Yea, come on Harley Davidson ...go broke and die for trump. The guy is delusional ...invoke the 25th now. Let Harley fold their tent and go, in the late 1980’s when Harley was owned by AMF and made junk motorcycles they got our government to put tariffs on Japanese bikes, later when it was time to retool their factory they did it by buying Japanese machine tools, let em go!